« Is Using a Capo Cheating? Summary: Others boast transparency, but the Paul Cochrane Timmy overdrive is one of the very few transparent overdrives I’ve ever used, and to me it is the best OD I’ve ever owned! Pros: Super-simple to dial in a great tone for the guitar you’re using. Bass and Treble cut knobs make all the difference in the world with respect to dialing in your tone! Tone Bone Score: 5.0 ~ I’ve only played with this for a little over an hour this evening, and already I’m in love with this OD pedal! You know me, I love OD pedals, but this one was well worth the wait. I can confidently say that this will NEVER leave my board. Like many, I had heard of the Tim and Timmy pedals from Paul Cochrane, but I had never played one. I had only heard accounts online, then heard one in action at a concert. After speaking with the guitarist (Dylan Brock of Luce), and hearing him rave about the pedal, I finally got around to ordering one from Paul Cochrane back in October 2010. I finally got the pedal today, and it is hands-down the best damn overdrive pedal I’ve ever played in my life – and I’ve played a lot of them. I now have only two overdrive pedals on my board: My trusty Tone Freak Effects Abunai 2, and now, my Timmy pedal. They will never leave my board. The Abunai 2 is much more of a distortion pedal than an overdrive and I love the color and compression it adds to my signal. The Timmy, on the other hand, is truly transparent. It takes your tone and give you more of it. 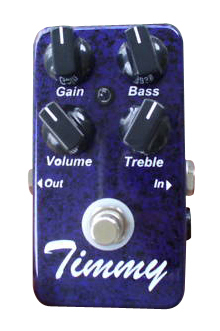 And while other pedals will give you a midrange hump or scoop your tone, the Timmy lets you dial in (actually cut out) the amount of bass or treble you want in your signal. Volume and Gain are pretty standard, so no need to go into those features. What makes this pedal special are the EQ knobs. Both are cut knobs. Fully counter-clockwise, they let in all the bass or treble. As you turn the knobs clockwise, they cut out. It’s a little backwards, but it makes sense once you start messing with the pedals. Paul says he made these like that because of the taper of the pots and doing it in reverse avoided dead spots. The bass knob functions pre-distortion or before the clipping circuit. Other pedals dial out bass at a fixed level to avoid the bass being too muddy. The Timmy allows you to dial in as much or as little bass as you want. The treble knob functions post-distortion. 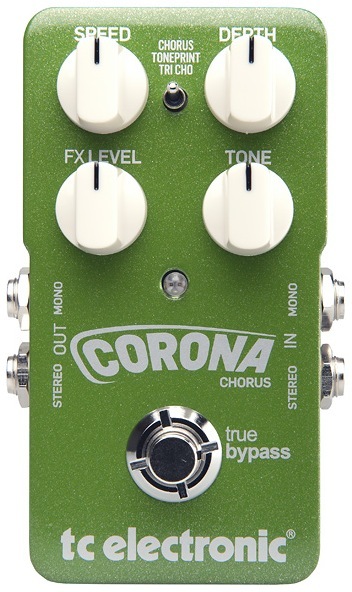 Again, other pedals have treble set at a fixed point after the circuit to avoid fuzziness. The Timmy lets you dial in as much or as little as you want. The net result is a finer level of EQ control than I’ve ever experienced with an OD pedal, and those two knobs make that pedal very special for me. I actually thought I was done with Overdrive pedals for the most part, and instead started relying on my clean boost and occasionally would fire up my Abunai 2 to add some color and compression to my tone. But that all changed when I got my latest Strat. Even though the Kinman pickups and the X-Bridge pickups have more gain than stock Strat pickups, even cranked, they don’t have enough gain to get my vintage Plexi-style amps into their sweet spot – even with the amp cranked. For instance, I had to use my clean boost and/or my Abunai 2 this past weekend to push my amp into its sweet spot. The clean boost works great in giving me the gain I need, but it doesn’t give me much sustain. The Abunai 2 gives me sustain, but it colors my tone and adds compression (I like that only for certain situations). Enter the Timmy. With the Timmy, I can get the gain boost I need to push my amp into its sweet spot, and with its clipping circuit, I can get a bit of sustain – but without the compression, which is HUGE for me. Mind you, this is all for a Strat. It’s a completely different story with my Les Pauls, as they have plenty of gain on tap, and have LOTS more natural sustain than a Strat. With a Strat, you always need some help. It’s not a bad thing, it’s just it is what it is. I know, I normally do some description of how it looks and how it’s built, but suffice it to say that the pedal’s built solidly, and the purple finish is cool. ‘Nuff said. It’s how it sounds that is important. As Paul explained to me six months ago, the Tim and Timmy were designed to be transparent overdrives; that is, they take your tone and give you more of it. Though the signal path does include a clipping circuit, unlike other OD pedals, the Tim/Timmy circuit doesn’t add any color. In any case, here are a couple of clips. In both clips, I have my Aracom VRX22 set up in its drive channel with the master and and volume knobs set to about 1pm each. With a Les Paul, cranked up in its bridge pickup, this will give me a sweet overdrive tone with lots of harmonics. With a Strat, these gain positions set it at the edge of breakup, and I have to really dig in to get distortion out of the amp. In my mind, there’s nothing not to like about the Timmy. When Dylan Brock said to me, “Man, I just love my Timmy pedal,” I really couldn’t understand what he was talking about at the time. I now understand, and I mentioned above, the Timmy will never leave my board. So are you ready to compare it to my Tim and my Dano clone? My Tim is one of my Favorites as well and I have a Timmy on order for my amp tech..
Great write up and clips.. I thought they were pretty similar, but the TOD seemed a bit darker. I haven’t tried the Timmy yet but the TOD just isn’t quite there. They stole the design and made it less adjustable. Not bad for a cheap pedal but like you said the Timmy is only $129 if you’re willing to wait…. To me, it’s totally worth the wait. I have got LOTS of overdrive pedals – some quite expensive like the KASHA that goes for $250. Doesn’t even come close to the Timmy. Once you dial in the tone for your particular guitar, the Timmy simply rocks the house! For me a review of a pedal someone has had less than one whole day day is of very little use. And worse yet is a comment left by a coward who won’t leave his real identity… You know how old this review is? Over two years, my friend. The Timmy has never left my board, and I don’t ever seeing it leave my board. In fact, it’s now the only overdrive I use. I was right about it back then, and I’m right about it right now.